The weather this week has been sensational. 20 degrees during the day and cool at night, but no need for heaters etc. The blackfish are all through the river and biting freely when the tide is moving. Back in Yamba for school holidays. We stayed in Grafton last night and arrived via Lawrence and the Bluff Point Ferry. It's superb coming in that way along the river, and especially on such a magnificent clear winter day. We stopped at Palmer's Island on the way in and grabbed some blackfish weed, black magic and some lovely fresh green weed. 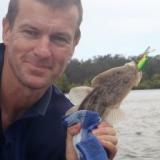 Last weekend was spent cleaning the fish way at the Lane Cove River, and kayaking for bream and flatties was the easiest fishing outing. Pretty soon it's going to be too cold for chasing bass, especially in the kayak. So, I was determined to catch at least one more before the end of the season. With a good forecast, I thought the early morning would be good and looked forward to hopefully being the only boat on the water.